A one year warranty through Dotcom Computers Inc. is offered on all products sold. Some of our products may fall under the original manufacturer's warranty as well. Please report issues regarding equipment defects within 14 days of receipt and we will issue a Return Merchandise Authorization tag. A refund or parts replacement will be given upon inspection of the returned product, serial numbers, and tamper tags. 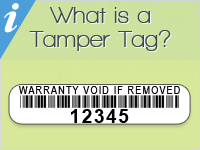 Please note that removing, puncturing, or altering the tamper tags in any way will immediately void your warranty. Returns will be processed and refunded within three (3) business days upon receiving the product back in our warehouse. If purchased with credit card, the refund will be placed on the credit card used. If payment was made by check, a refund check will be created and mailed to the customer within four (4) business days. If payment was made through PayPal, the refund will be sent directly through PayPal. Refunds for payments through wire / bank transfer will be refunded in seven (7) business days and refunded directly to the bank account used to pay originally. All returns for a refund are subject to a 20% restocking fee. We only offer replacement on defective items. If we have no replacement item to offer you, then a refund will be offered with the restocking fee waived. No returns for refund will be offered after 30 days from invoice. What shipper do we use? We accept all major credit cards including Visa, MasterCard, Discover and American Express. We also accept PayPal payments. If you prefer to pay via company check you may do so. Payment must be made within seven days of purchase. Overseas orders outside of the United States and Canada must be paid via bank transfer unless prior arrangements are made. You may place your order over the phone by calling 1-800-798-3682. Dotcom Computers Inc. offers a one year standard warranty on all products sold on our website (https://dcomcomputers.com). The warranty is through Dotcom Computers Inc., not the manufacturer of the product. A two year warranty is available as an option on select products. The warranty period begins on the date of invoice. Replacements do not affect warranty date going forward or reset warranty time period. The warranty on your equipment covers all normal wear and usage. Customer error and misuse such as spilling liquids or dropping the equipment are not covered. Acts of God such as floods, lightning, earthquakes, and other natural disasters are also not covered. After 30 days, all returns will be for replacement only. Dotcom Computers has a simple easy to understand shipping policy. We do our best to get your products where you want them when you want them. We ship once payment for an item clears. We do our best to ship within 24 hours of payment clearing. In the event we cannot ship within the first two days (low stock or other unforeseen events), we will reach out to you and let you know the problem. Shipping carriers can be selected during the checkout process. Our preferred carrier is UPS but if you prefer another method please contact us directly to make alternate arrangements. If you pay with ECHECK via PayPal it takes up to 4 days to clear from PayPal. Product will ship once payment clears. A tracking number will be sent to your email address once the product has shipped. Shipping charges can be estimated via an estimation tool on the shopping cart. Since these are estimates, additional shipping charges may be added to your order. Dotcom Computers Inc. takes pride in getting 99% of our orders shipped the day the order is placed (must be placed by 2pm to qualify). We reserve the right to ship using the carrier of our choice between FedEx, UPS, and USPS. We do our best to factor in the shipping times for our customers. While we do our best to ensure your order makes it to your location on time, we do not guarantee delivery times. Shipping carriers can be selected during the checkout process. Preferred carrier is UPS but if you prefer another method, please contact us directly to make alternate arrangements. We do our best to ship the same day or following day after payment is received. If you pay with ECHECK via PayPal it takes up to 4 days to clear from PayPal. Product will ship once payment clears. A tracking number will be sent to your email address once the product has shipped. Shipping charges can be estimated via an estimation tool on the shopping cart. Since these are estimates, additional shipping charges may be added to your order. Dotcom Computers Inc. reserves the right to modify these policies at any time without prior warning. For us to match our competitor's pricing you must first present us with a link to the product, or a formal quote presented by the competitor. The item must be in stock and in "like" condition (new versus refurbished, grade A versus grade B, etc.). Auction sites and marketplaces such as eBay and Amazon are not eligible for price matching. We reserve the right to accept or deny any price match inquiry. All decisions are made final by Dotcom Computers. Dotcom Computers does not guarantee the accuracy of any prices, descriptions, text, specifications, compatibility, photos, images, or other. Dotcom Computers does its best to provide the most accurate information possible; however, Dotcom Computers reserves the right to change, alter, and or update the site at any time. Dotcom Computers also reserves the right to cancel any order or promotion at any time. To send periodic emails - We may use the email address to send User information and updates pertaining to their order. It may also be used to respond to their inquiries, questions, and/or other requests. We may use the email address to send company news, updates, related product or service information, etc. If at any time the User would like to unsubscribe from receiving future emails, we include detailed unsubscribe instructions at the bottom of each email or User may contact us via our Site. Polices are subject to change at any time, without prior notice.